Unfortunately, the weather got the best of us this trip. We had mostly sunny skies during the days, but the wind was whipping like crazy! When we have high winds the water becomes too rough for us to work and we end up anchoring for cover. But, even with the wind we were lucky and had a few good encounters. While we were surveying on Little Bahama Bank (LBB), when we had any break from the wind, we saw one bottlenose. We call this individual Jagger. 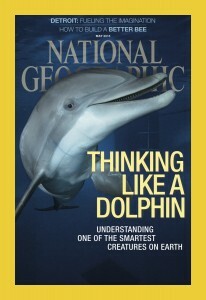 This bottlenose is very easy to identify because of the very distinct dorsal fin, which can be seen in the photo below. Even though we could easily identify who we saw on LBB, which helps with our census records, this bottlenose was the only one to stop by our bow at our first study site. 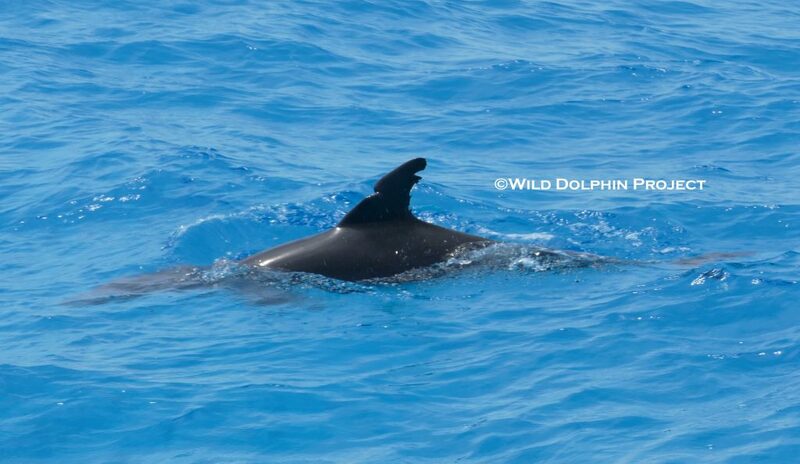 This is a dorsal fin shot of an adult bottlenose dolphin in our LBB study site we call Jagger. From left to Right- Dr. Denise Herzing (founder of the Wild Dolphin Project), Cassie Volker (Research Assistant), and Hussain Aga Khan (FOS founder and photographer) observe an adult Atlantic spotted dolphin we call Finesse. On our way back to the states we did get a nice surprise. We came across a large seaweed patch floating off the coast of Florida. 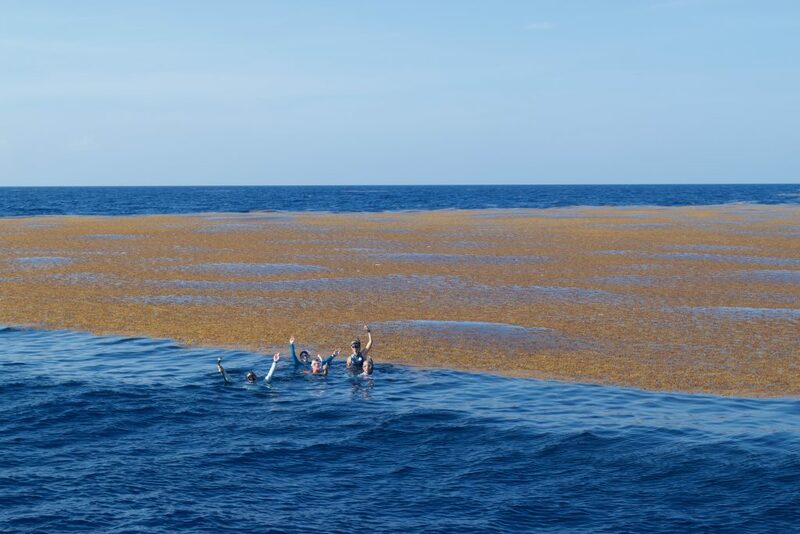 These floating patches provide cover for a ton of marine life including many different species of fish, baby sea turtles, and small crustaceans. Everyone wanted a chance to hop in and see what was hanging out underneath. Below are some pictures. The first picture is of our first mate from last year, Jimi Donovan, taken by our field intern Liah McPherson. The photo is of Jimi swimming underneath the patch. Just look at how dark it is under there! The second photo shows everyone next to the floating patch. 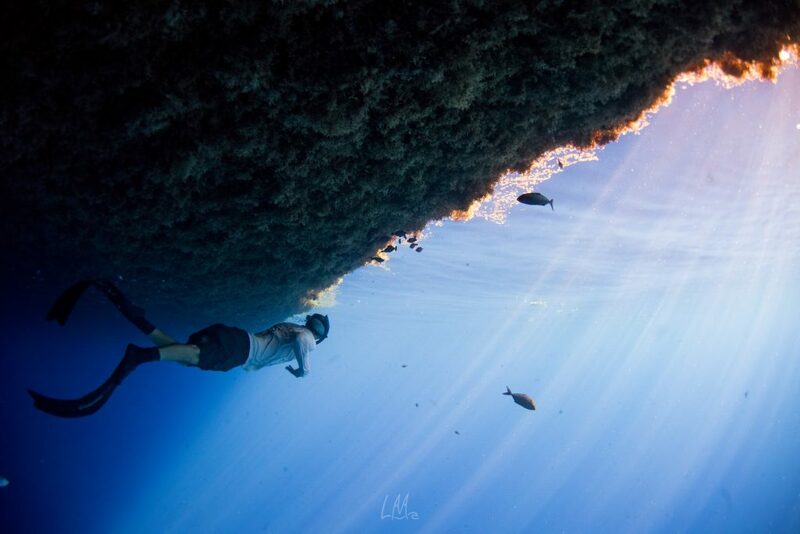 Our first mate from last season, Jimi Donovan, swims under a seaweed patch floating out in deep water in the Atlantic Ocean. Photo by Liah McPherson. Photo taken by our captain Brad Ruda: From left to right- Jimi Donovan, Morgan Will (field intern), Theresa Carlsen (our awesome cook!) Liah McPherson (field intern), and Hussain Aga Khan (FOS founder) all stopped for a quick picture next to the huge seaweed patch. All in all we had some good encounters and a unique opportunity to scope out the seaweed patch. 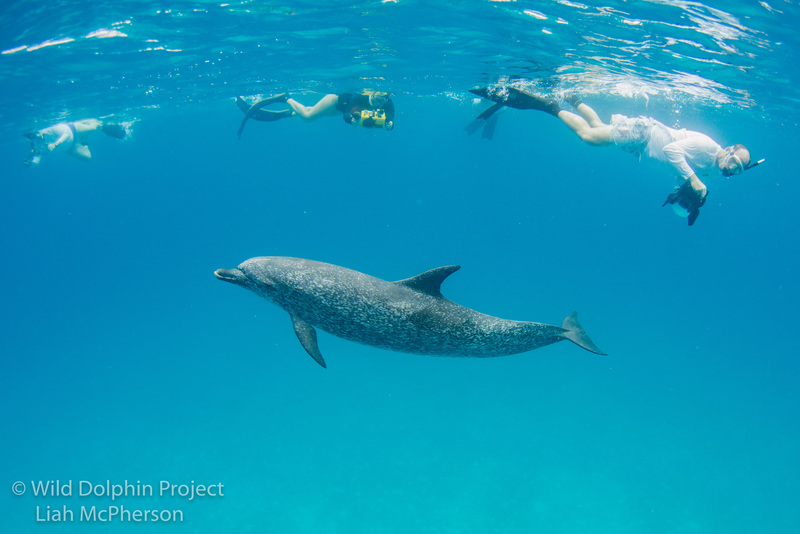 It wasn’t as dolphin filled as we would of liked, but hey that’s field research working with wild animals! Follow up with us on how trip 7 went with our next blog coming soon.